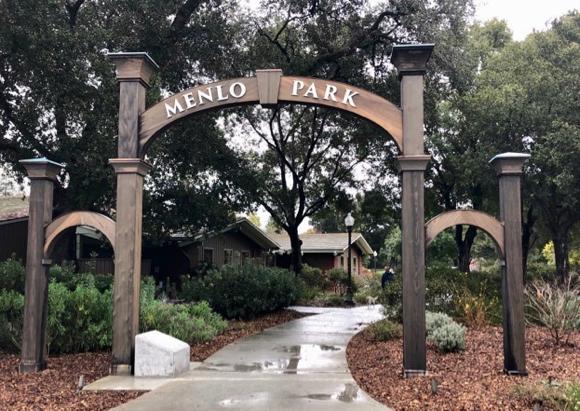 A ribbon-cutting ceremony honoring the completion of a wooden arched gateway that replicates what had stood alongside what is now El Camino Real from 1855-1922, will be held Sunday, March 17, at 2:00 pm at the Menlo Park Main Library. The tall main arch had the name MENLO PARK painted across the top by the two Irish men, named for the ranch they owned behind the gateway. The archway name faced eastward. When railroad tracks were installed in 1863, “Menlo Park” was used as a reference for the temporary end of the line while a bridge was being built across San Francisquito Creek to continue the tracks toward San Jose. The name stayed in use and was chosen for the name of the train depot built alongside Ravenswood Avenue. The replica gateway with MENLO PARK letters back in place once again faces toward the depot only now from the corner of Ravenswood Avenue and Alma Street, where the brief ceremony will be held. The gateway project was initiated by the Menlo Park Historical Association (MPHA), whose office is in the adjacent library building. Funds were raised through donations by businesses as well as individuals and matched by the City of Menlo Park. The city provided the civic center location for the installation and will take ownership of the gates. Mayor Ray Mueller will address the March 17 gathering, which is free to the public. The gates date back a year before San Mateo County was created. In 1855, Leland Stanford was still tending his general store in the gold rush foothills. El Palo Alto had twin trunks but the town of the same name was 40 years away. Mayfield was the name of a farm on the County Road, to become an official township that year. Franklin Pierce was the American president with Abraham Lincoln two elections away. The painted MENLO PARK letters faded away over time as the gate remained a weathered but honored city landmark, avoided by the busy activity of World War I’s Camp Fremont. But in 1922 an automobile late at night careened into the aging structure, splintering it into a pile. In 2014, members of MPHA begun a long-discussed effort to recreate the gates. Years of fund raising ensued until work began late last year. The committee members, some of whom passed away during the process, will be honored on March 17. The gates architect and contractor Sam Sinnott, is also a MPHA and Menlo Gates Committee member. “Menlo Park” was chosen as a name by one of the two Irish ranch owners for Menlo village, near his hometown of Galway, Ireland. Fittingly, the ceremony will be held on the afternoon of St. Patrick’s Day.